Every CEO or leader has spent some time in what I call firefighter mode. It is that type of leadership where you are the one that has to make decisions and put out fires. You want to be a servant to your people and remove challenges. You think it is the best use of your time. Well, that is until you stop and think about it. For me, it took hiring a leadership coach as I was running a $1m company and all I had before the coach was fires to put out. Becoming a leader that is effective and respected means you have to stop being a firefighter. Becoming a leader is intentional. In this short video, I share my story of being a firefighter and how I broke the pattern to become a leader. – Have you ever felt like a firefighter in your business? I know I’ve felt this way many times before when I was growing a business and even sometimes today. Because you have a well intended list of things that need to get done. I don’t know whether you write them down, put ’em in your phone, put ’em in your calendar, whatever it may be, you know that if you get those things done, it’s a productive day. You’ve made an impact. And you start off with very much intention to get those things done. But what happens? Well, you get a customer problem so you gotta take a break and go take care of that. Or you’ve got an employee problem and you’ve gotta have that conversation. Someone needs to ask you. Someone needs to come in and you need to fix it. You’ve gotta make decisions. And it’s just fire after fire after fire. Can you feel me? Have you been there? I know I have, as a leader. And in fact, when I first started running a company back in 2001, we had about a million in revenue and I joke from the stage, when I speak to large audiences about this, my revenue was up here for the business but my leadership capability was way down here. I’m not sure if this is in there but trust me, I was way underperforming as a leader for the size that my company was growing into. We had six employees and they were all making more money than me. Yes, they were all making more money than me that first year. Now, what changed in my journey? Well, I’ll tell ya that in just a minute. My name’s Gene Hammett. I work with hyper-growth companies. I research hyper-growth companies to help them understand how their leadership and culture can become a competitive advantage. And I wanna help you too. If you’ve ever felt like a firefighter in your day-to-day work, you’re doing it wrong. Because what you want to do, is you want to create the kind of business where it’s very intentional and proactive. That you’re no longer having to, you’re up in your day to fight these little fires. You wanna give your employees the permission to fight those fires and you wanna give permission to create systems that allow them to not be fires in the first place. I know that would be awesome, right? You wanna empower them to fix the problems that keep showing up over and over and over. And they wanna come to you with solutions, not just problems. And if you put yourself in the middle, if you step in because you can fix those problems, you do it every time, they are going to rely on you. You’re not going to be able to go on the vacation that you wanna go on to for as long as you wanna go to. And you’re gonna stress about it while you’re there. But if you create the kind of growth culture that I’m talking about, you will be able to be the true CEO of your company. Now, all this stems back from my time as a CEO in an international sports tour company, where I struggled with this for the first year or so. I got an outside coach to come in to help me see what I couldn’t see for myself. To help me really be a new set of eyes on everything I was doing inside the business. And one of the first things we talked about was how do I organize my day? And I told her the story that I felt more like a firefighter. She’s like, “ah, I get that all the time.” So I’m sharing this with you. Maybe this will be the moment where you really think about how you’re showing up, who you’re being inside your business. Who is it that you want to be? Do you want to be that proactive leader, where you’re really not having to fight the fires everyday, people are fighting them for you, and there’s really less fires than before, and you’re growing? Or do you want to continue to be the person that is of highest value to that organization and for them to need you and you wanna solve those problems day in and day out? I can tell you from firsthand example, or firsthand experience, excuse me, is that you don’t wanna be the firefighter. You’ve gotta be the CEO. If you wanna create a company that is growing fast and creates that Inc. 5000 kind of level of growth and goes beyond that, makes it two times and three times. You wanna create a team, around you, that has a growth culture. Now, I share all this with you because I’ve been there and I understand it. And if you have questions about this, if you wanna break that pattern, make sure you reach out to me because I’d love to help you, get to know you. All you have to do is email me at genehammett.com and then we can talk about your business. It’s not a sales call, I just wanna get to know you. But if you really are getting some value out of this, make sure you reach out, tell me, I’d love to know. Again, if these are something that you want to subscribe to, make sure you put ’em on your phone and don’t miss an episode. 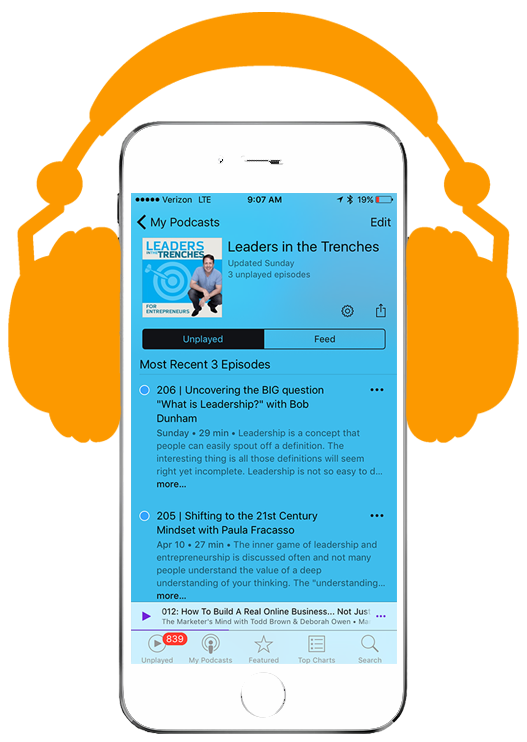 The interviews, the hyper-growth tips, all of these things are just for you, as a leader. As always, lead with courage and I’ll see ya next time.